You can generally get a pretty good feeling of what your flight will be like on US Airways when you book it: US Airways like to try and charge you for every little thing, showing to a large extent how much like a low cost carrier they have become. Some US Airways charges are amazingly expensive. One of the most annoying things about US Airways is the way when you are booking flights, taxes are not included in the initial fare presented: it will them jump significantly at the last stage of booking. Even though this process is illegal in several countries, including the UK, US Airways still carries on with it. You can however book seats once you are through the stage where you have to give your name etc, however 'Choice Seats' (ie, emergency exits, etc) cost US$35 extra transatlantic. You can also buy a club day pass for $29, but beware, this option is often offered even when there is no club you can use. At least transatlantic and to Brazil bags are free: on domestic you'll also end up paying US$25 for the first, US$35 for the second, and a whopping US$125 for the third. Check in at US Airways varies from a complete zoo at some outstations, to an orderly line at Gatwick. Then you get to the desk, and see why there are delays: many people are complaining about paying US$70 for a second checked bag. However, there is always priority check in for those in Envoy class, and Star Alliance Gold can use it too. As a gold, make sure your status is noted at checkin: as a US airline, US Airways are more sensitive to upgrade requests than most, and these are always handled by status tier. 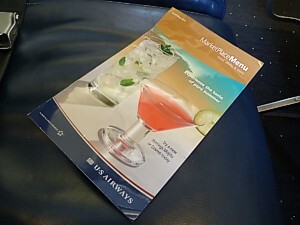 In Business (Envoy) Class on US Airways, its generally a fairly smooth operation. You are greeted at the door, although not shown to your seat, and there are normal pre-flight drinks, along with blankets and (free) headphones. If you are on the Airbus A330-200 you'll also be asked if you'd like to be shown how the new seat works. AVOD is switched on after takeoff, and then the service comes around. It's pretty quick: there are two trolleys down each aisle, preceded by drink orders, and then the dessert trolley. What takes time is clearing up the plates later: that can take quite a while, but in generally so long as you get the new A330-200, the business class experience on US Airways is better than on many other airlines based in the USA. But when asking 'what is US Airways like? 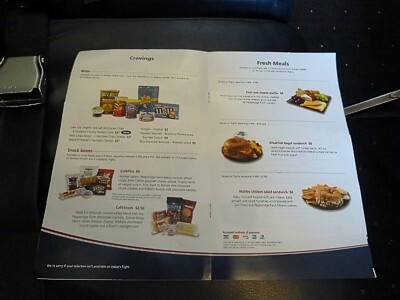 ', many people find Economy (Coach) on US Airways is a totally different ballgame. After takeoff, you'll be asked if you want to purchase earphones: they are not complementary on US Airways, you'll have to pay $5. You can however save money by bringing on your own, so long as you have 2 prong airline ones (or ones with an adaptor). There are free meals, with two different options. These come around on trolleys from the front, and you will then asked if you want to buy alcoholic drinks, at $7 a go. Never use a credit card for this (unless you are an American) as you will also be charged a 'foreign transaction charge' of up to $13, because the charge is processed in the US, making it $20 a beer! Amazingly expensive, and to rub in salt into the wound, you can only buy one beer at a time, so you can't stack up and save on multiple fees. Thankfully US Airways take cash for transatlantic flight, but they will only take US dollars: hence, take a stack on board, and always pay in cash. Dear oh dear, you didn't expect much on US Airways did you? Whatever your expectations are, reduce them. This is particularly noticeable if you come off an international flight, and transfer to domestic, where US Airways certainly shows how low-cost it has become. In First Class you should not expect any food, even if you pay for it, on flights of less than 1.5 hours, however at certain times of day you'll get a Biscoff sweet biscuit or savoury cocktail mix. Above 1.5 hours, you get a snack basket which comes through the cabin about 20 minutes from the start of the flight with crisps and chocolate bars. The only exception to the starvation diet is on a few of the longest flights which are over three and a half hours long. Here there is breakfast from 5am to 9am, lunch from 9am to 3pm, and dinner 3pm to 8pm. Otherwise, what you are paying for is the seat, and nothing more. You do however get free alcoholic drinks, including a pre-flight drink of whatever you like: this is brought to you as you sit down. In effect this means three type of beer that are sold in economy, spirits, or wine; you'll generally be offered three refills on the flight. There is no inflight entertainment. In Economy Class (called coach class on US Airways) there is nothing. On flights up to 1.5 hours, there isn't even a trolley service, however above this a trolley, starting at the front, which offers free soft drinks or coffee. You have to buy alcohol. Beware that this is astounding expensive, and you cannot pay by cash. Normally beer costs a $7 for a small can, and if you not from the US you will be charged a 'foreign transaction charge' of up to $13, because the charge is processed in the US. You will also pay in your 'home' currency, at a ruinous exchange rate, making it $20 a beer. You cannot buy more than one beer at a time to avoid the charge. Hence, for many people, US Airways has become a dry airline. US Airways boards by zone, although at some airports, it tends to turn into a rugby scrum where everyone boards at one. However at least, there is a theory to it. Zone 1 is the elite: Either First Class & Envoy, or those with the right frequent flyer card such as Dividend Miles Gold, Platinum and Chairman's Preferred members, and of course Star Gold members Zone 2 are the semi-elite: Dividend Miles Silver, holders of US Airways credit cards, and those who have paid for a 'choice' seat. Zones 3 – 5 are all the rest, but to speed up the process, US Airways boards those at the back first; that is, those in zones 5, then 4 then 3. News: US Airways has now axed all of the free baggage allowance for economy for domestic flights: the only bag you'll get on board free is the one you carry on: hence, many people come on board with a huge rolling case, and then go through the routine of saying there is no more free space - and hence they get it checked in for free, rather than pay the US$25. US Airways has a very generous carry on allowance, compared to many airlines. Gone is the weight restriction, and now you'll see pretty much everyone carry on huge and very heavy bags. You're allowed one carry-on bag and one personal item. Personal items include a purse, briefcase or laptop bag: this laptop bag can be large, very large. The carry on bag size has a maximum total of dimensions of up to 45 in/115 cm (14 x 9 x 22 inches or 36 x 23 x 56 cm), and can be up to a thumping 18 kg (40 lbs), although you must be able to lift it into the overhead lockers: the crew won't help you with this. Beware that on some of the smaller regional flights (which can actually be quite long) operated by the Embraer 190, the cabin is tiny, and the overhead bins are even smaller. Now, this is fine if you are in First, as above First on the right hand side of the cabin there are large, normal sized overhead lockers. But everywhere else the bins are tiny, with a maximum height of 2 inches. 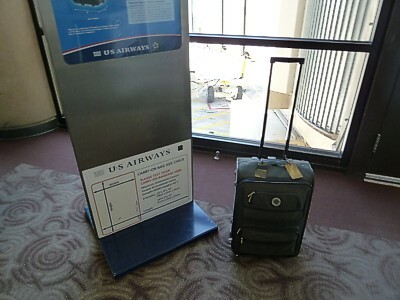 Hence, here, US Airways have a novel system that if you have a normal sized wheely bag, you drop it at the airbridge (ask for the special tie on label for this). It's then put in the hold – and you collect it from the airbridge when you deplane, after hanging around for a bit. When checking in your bag, each bag can weigh up to 22kg (50lbs). Beware of the rule in the US that you have to collect your bag when arriving off an international flight, go through customs with it, and then check it in again. Domestic in economy (coach) the first bag costs US$25, and the second is $35. The price then rises hugely, with the third $125, and the fourth an amazing US$200. International in economy (coach) to & from Europe, the UK, and Israel, the first bag is free, but the second is much more expensive, at US$70, then $200 for the third and forth. An odd one is Brazil, where in economy you get two bags for free. As always, these rules can change. US Airways's website has details of exactly what you can take onto a flight.